What?!? Another non-vegan, non-sugar-free recipe? And, this one isn’t even dairy-free? How could that be? Well, a kiddo in my life told me his favorite cookie is M & M cookies. This isn’t my kiddo. But, I’m a sucker for all kiddos, even if they’re not mine. So, well, M & M cookies it is. You could easily make these dairy-free by popping for some vegan chocolate lentils. And, after I made these, I was so jealous of their buttery, sweet goodness, that I promptly washed the dishes, and whipped out a batch of vegan, grain-free chocolate chip cookies. I promise to post that recipe next, okay? Preheat the oven to 350°. In a large bowl, beat the shortening and sugars. Add the egg and vanilla and beat well. In a small bowl, whisk all the dry ingredients except the M & M’s. Add the dry ingredients to the wet ingredients and blend well. Fold in the M & M’s. Drop by rounded teaspoons on to parchment-lined baking sheets. Bake for 10-12 minutes. This entry was posted in chocolate, cookies, desserts and tagged cookies, M & M's, recipe. Bookmark the permalink. Thanks Shirley, I can’t even remember exactly what an M&M tastes like. Oh well. I used to LOVE M&M cookies! Yum. Well you are just “almost vegan” so you could still eat them, yes? Thankfully, or should I say unfortunately, I can still eat M&Ms! That picture is just evil, Deanna! 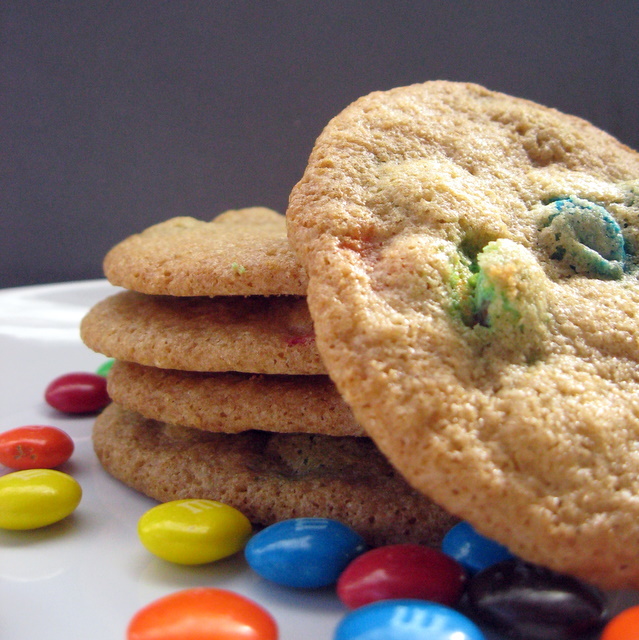 Your M&M cookies look so delectable & apart too!